Back pain – both lower and upper – are amongst the most common conditions that we treat at Shefford Osteopathic Clinic. As well as alleviating your pain and keeping you mobile, we also offer tips and advice to help you to manage and prevent back pain. Firstly, please be reassured that is it is safe to exercise with back pain! In fact, exercise is excellent for your back and general health. You will not damage anything or wear your back away with safe movements (within reason, maybe skip the bungee jumping!). Remember, if you have any queries or concerns, the Shefford Osteopathic team is here to help you. Walking Even a gentle walk is great for getting the back moving and keeping you healthy. 30 mins of walking 3 days a week is equally effective for pain reduction as a course of back specific exercises. 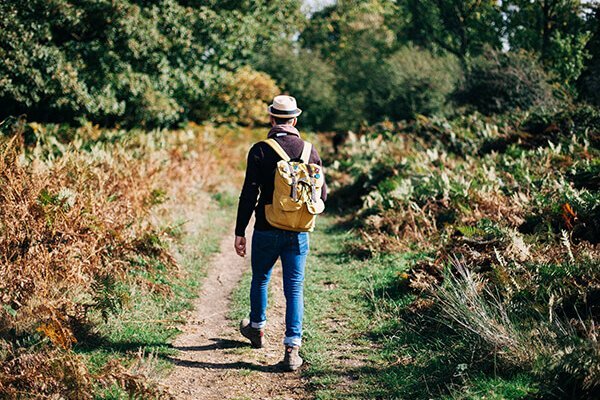 Walking takes no equipment and no specialist knowledge… just get out and enjoy! There are some lovely walks locally and most walking groups are very welcoming. Strength or resistance training Strength training is safe if you build up gradually and increase over time. Even training with weights has been shown to help reduce back pain as well as keep the bones strong. Don’t worry – you won’t suddenly look like Popeye! (That takes years of hard work and special diet.) Weight-based training protects bone and muscle strength as we age and so we can stay active for longer. Weight training is the most effective way to reduce body fat and improve the way we look and feel. It’s also good for blood pressure! This type of training can be done at home or in any of the local gyms or outdoor exercise classes. It’s more fun than it looks and the results will have you hooked in no time! Pilates/ core stability This safe and gentle type of exercising is great for back pain. In the short term it offers a greater reduction in pain than other forms of training. Long term, all exercise is helpful regardless of the type. Pilates is mainly about strengthening the back and tummy but can be a very good, holistic workout. Yoga Yoga is great for flexibility and improving movement. It can help with feelings of stiffness and tight muscles as well as general relaxation. It’s a really good way to improve your posture and breathing and is very relaxing. It’s not all gongs and incense! Swimming Swimming is very gentle and safe. In fact, it’s very hard to hurt yourself in a pool! Swimming has good benefits for the back and shoulder mobility, but will not protect bone density as it is not weight bearing. So swim for building a strong heart and lungs and improving muscle. Remember that your bones need weight-bearing exercise on them to get stronger! To summarise, all exercise has benefits and no one type is better than another! The exercise that you enjoy doing and are likely to stick to over time will probably be the best for you. Walking is a very easy and safe way to start regardless of your fitness level. Get out, get moving and enjoy better health. Movement is medicine.